We got to see some of the most glorious landscapes any traveller’s eyes can have the fortune of beholding. 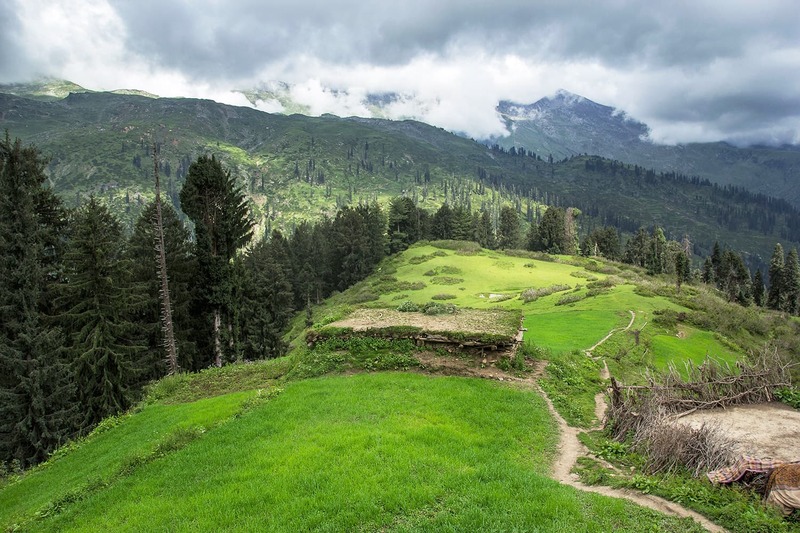 Siran Valley, a lesser-known valley in Mansehra District, Khyber Pakhtunkhwa, is one of my favourites in Pakistan. Not because I hail from there, but because I have seen and explored some of the most magnificent landscapes in the valley that are seldom visited. Last year, my cousin insisted on taking me to the Pleja Meadows, a part of the Siran Valley, which is by far one of the best places I have ever seen. This was in July of 2016. After that visit, we made plans to go again the following year. 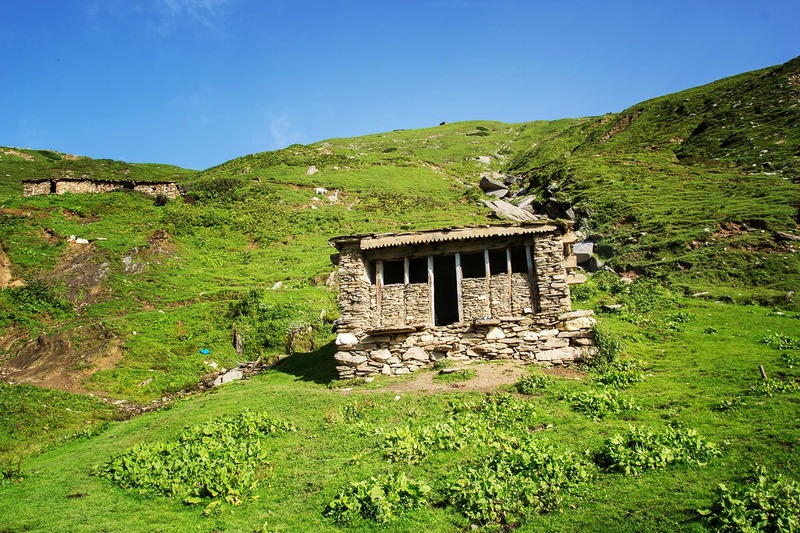 But this time, we wanted to explore the other side of Siran Valley — the villages of Mandagucha and Jacha — travelling through forests and then taking the snow line all the way to the Khanda Gali peak and Neeli Nadi. Whenever I plan for a trip, my friends get excited and almost always want to tag along. But this time, none of my friends from my usual posse could join me, most likely because the trip was very physically demanding, involving hiking all the way up into the forest. However, three of my cousins from Jabori and two friends, Adeel and Babar, all the way from Karachi, joined me in my adventurous undertaking. One of my cousins Hammad, a guard for the forest of Mandagucha — which was to be our first stop — had invited us. An hour after I left Mansehra, I had travelled 40 kilometres and reached Jabori where my cousins were getting ready to accompany me. From Jabori, we hired a minivan for Mandagucha which was 19 kilometres away. The driver said that he was pressed for time and had to reach somewhere else in a short while, so he drove at a very brisk pace. The way he drove, like a man possessed, literally had us on the edge of our seats. Half an hour later, we had reached our destination. It’s fortunate that none of us get travel sickness or that could have been a very messy journey. Upon our arrival, we were greeted by the sight of a beautiful house that belonged to a friend of Hammad’s. This is where we were to spend the next three hours. It was here that Hammad called upon the assistance of a babaji as we had plenty of luggage. Babaji arrived a short while later with his donkey, and soon he was off with all our luggage, making his way to Dhor, a village located 10 kilometres away alongside the Siran River, and the place where we would be spending our first night. All our luggage went except my camera bag; I prefer to keep this little treasure with me at all times. While there, we made an astounding discovery: walnuts. We found walnuts everywhere! The walnut is a common fruit in Siran Valley but I learnt that the best walnuts can be found in Mandagucha. We ate plenty of these and then hit the road, eager to continue our adventure. From Mandagucha to Jacha is a distance of five kilometres. And another five from Jacha to Dhor, a nice parallel track to the Siran River. Although this was a pleasant walk, when we reached Jacha it began to rain, which made the journey forward somewhat harder. By early evening, we reached Dhor, but by then the temperature had dropped. When we got there, we met Shah Hussain, our host for the night. He took us to a tea shop where they make tea for travellers. After thoroughly enjoying the hot beverage, we went to Shah Hussain’s guest room. My cousin Hammad and his fellow guards often use this room when they are visiting the fields. After resting for some time, we went to the river to try our luck at fishing. As I tried to document the adventure through photography, my cousins attempted to catch some fish, while a local played a tune on his flute. By then, the weather had begun to get cold. Having had no luck with fishing but some luck with photography, we headed back to our guest room. We lit a fire to warm our cold bones from the chill we’d felt outside, and sat down for dinner. 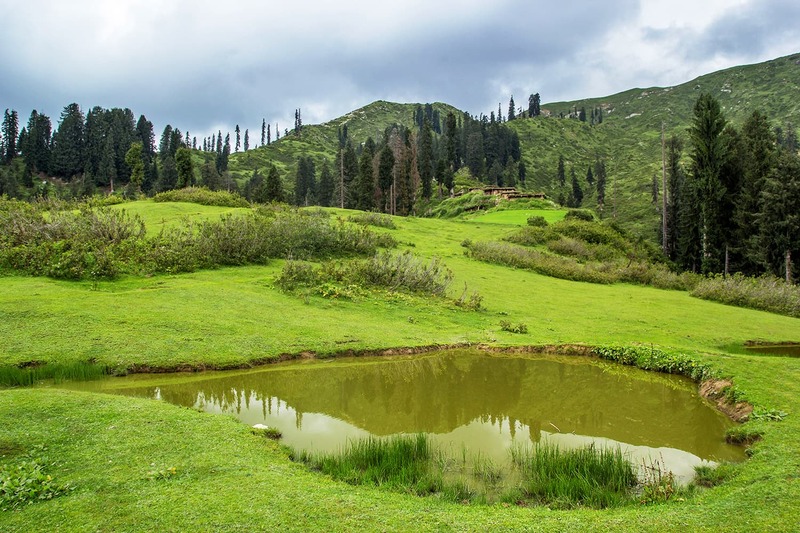 A pond right in front of Musa Ka Musallah peak. 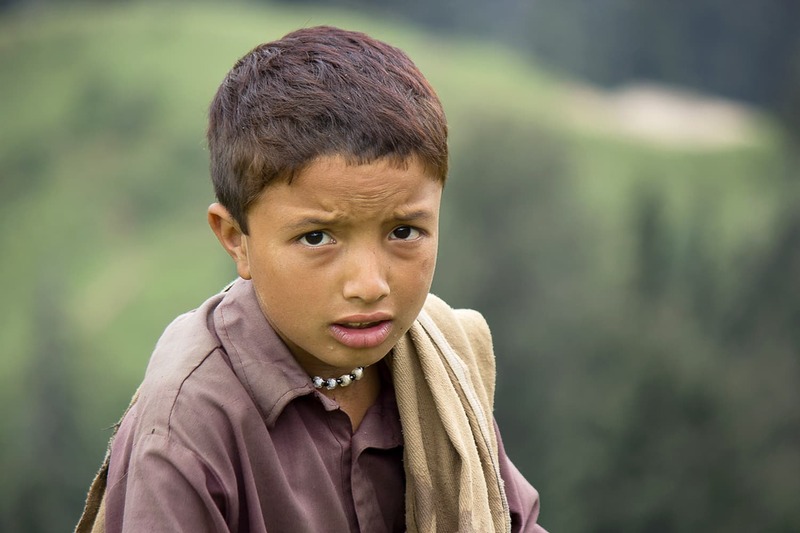 A curious, friendly boy at Araam Gali. Dinner was a simple affair: all organic vegetables washed down with buttermilk, with yoghurt and cream on the side. It was still raining as we lay down to rest for the long day ahead of us. The next morning, after having a nice breakfast with Shah Hussain, we began walking. We were determined to to reach Araam Gali and spend the night there. As the donkey was struggling to climb uphill, we were left with no choice but to take our luggage on our backs. Shah Hussain arranged a guide for us, Shafi, a resident of Thanda near Araam Gali. After a two-hour walk we reached Kaalu Aala Kalaas (a name given to the place by its residents in the Gojri language), which was a pleasant meadow in the middle of the forest, five kilometres away from Dhor. We spent plenty of time there and I even joined some children there to play gilli danda. We were served some delectable cookies with tea to fuel up for the hike ahead; the journey was going to be tough and we had to be prepared for it. We had to climb for the next five hours. A beautiful view of Kunaali from Khanda Gali. 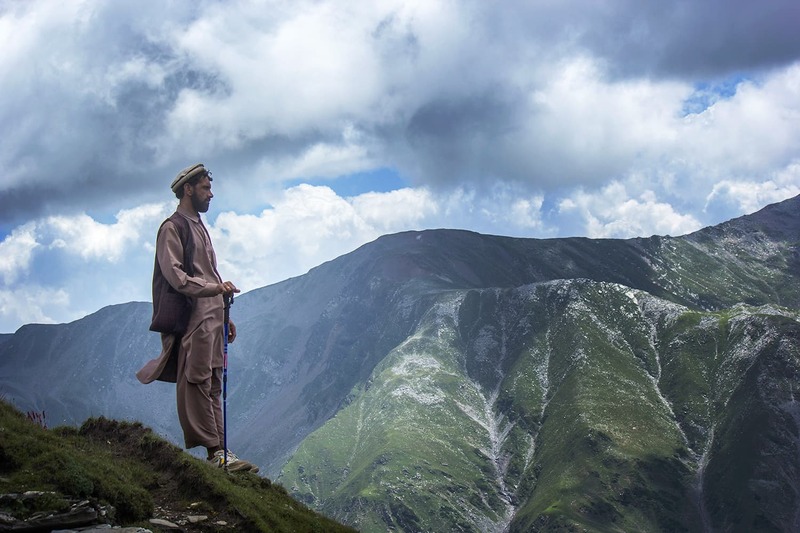 Hammad and Babar walked with ease, unperturbed by the terrain. Hammad is no different from a resident of the area we were traversing, because it was his own territory of inspection and he was used to it. Babar, is a great hiker having explored most of the places by foot and has the stamina to hike all day. Adeel and I, on the other hand, are not good hikers. Many a time we lost our way whilst hiking. The ascent was an extremely trying experience. But shortly after crossing the snow line, the glorious sight in front of our eyes was enough for us to forget the ordeal of getting there. Kunaali, the site we had reached, is almost 15-20 kilometres from Dhor, and is far steeper than Kaalu Aala Kalaas. There we had to cross the forest line to enter the snow line. After spending an age just taking in the fresh air of Kunaali, it was time to start taking some photographs. By now we were also feeling the pangs of hunger, so Shafi went to get some food. Would you believe that they had run out of rice and vegetables, but were kind enough to make some fresh roti for us? This was accompanied by a glass of yoghurt with salt for seasoning. It was not a culinary delight by any means but being ravenous meant we didn’t have a choice. We still had to hike for two hours to reach Thanda, two kilometres away, where we stayed overnight. We thought it best to buy a chicken from Kunaali and take it with us for our dinner. Somewhere near Manna in the forest of Jacha. The next couple of hours were very rough, but before nightfall descended, we reached Thanda. We rested in a guest room at Shafi’s house, where he served us some tea. We were right in front of the Moosa ka Musallah peak. From Dhor, we had to reach Khori and then travel on to Musallah summit. But we wanted to explore the meadows ahead of Moosa ka Musallah first. There is a place there called Panj Nadi, a sight of five big glaciers that originate from the Siran River. After finishing our tea, we headed toward a mosque. The houses people there live in are called taara in Hindko. 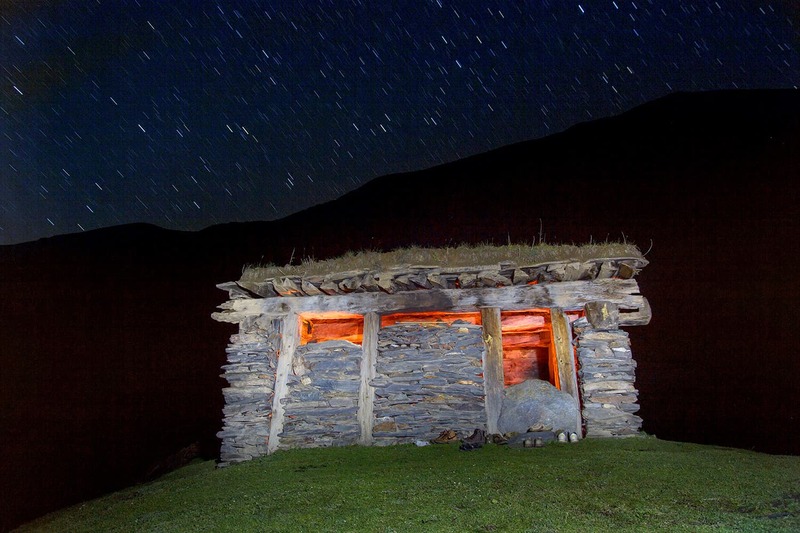 A taara is made of stone, and usually three are built: one for the family, one for livestock, usually sheep and goats, and a third for the mosque where travellers can stay for the night. The mosque where we stayed had no doors or windows. We built a fire indoors as the weather was becoming very chilly. As evening turned to night, even colder weather enveloped the little taara, which felt like a loving mother, protecting us from the horrible, icy tendrils of the invisible cold. A masjid without a door or windows where we spent our second night. A taara made of stones in the middle of nowhere. In a few moments, our taara was lashed with heavy rainfall accompanied with loud thunder. That night, Shafi cooked some highly flavourful rice with kidney beans along with the chicken we had brought from Kunaali. We had some butter and cream as well. The tempest outside, coupled with the fact that our taara didn’t have any doors or windows, was ample encouragement that we should slip into our sleeping bags as soon as possible. We were spent from the day’s hike anyway, and soon fell asleep. The next morning we were greeted by an amazing, rejuvenating sunrise over the Moosa Ka Musallah peak, a far cry from the previous night’s doom and gloom. After having a hearty breakfast, we had to say goodbye to Shafi and set off in order to reach Aram Gali, where we were going to meet our next guide. 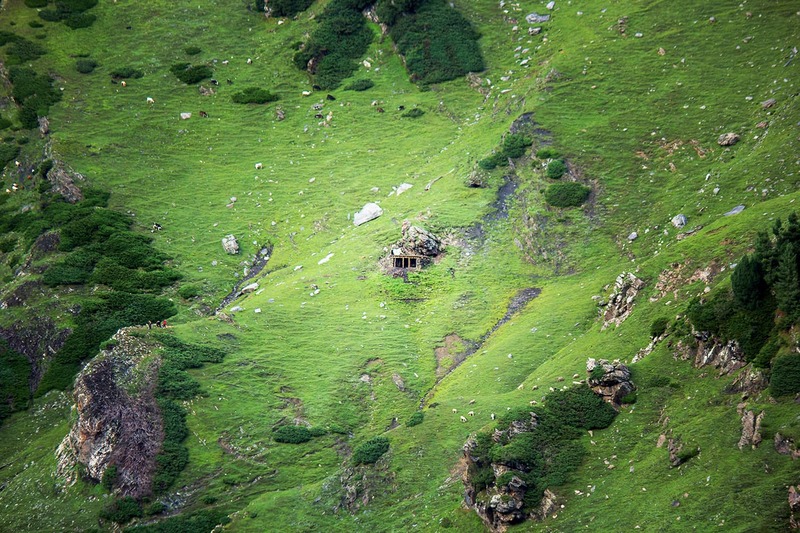 A broad view from Araam Gali. 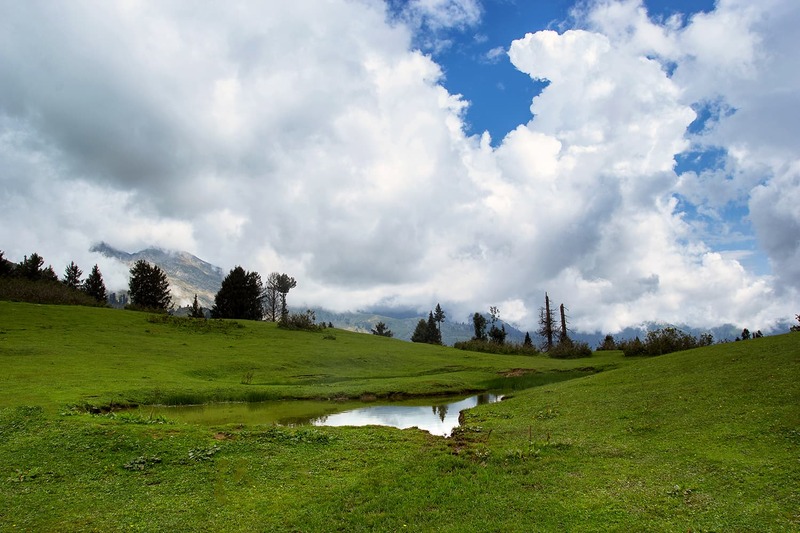 The meadows in Araam Gali. 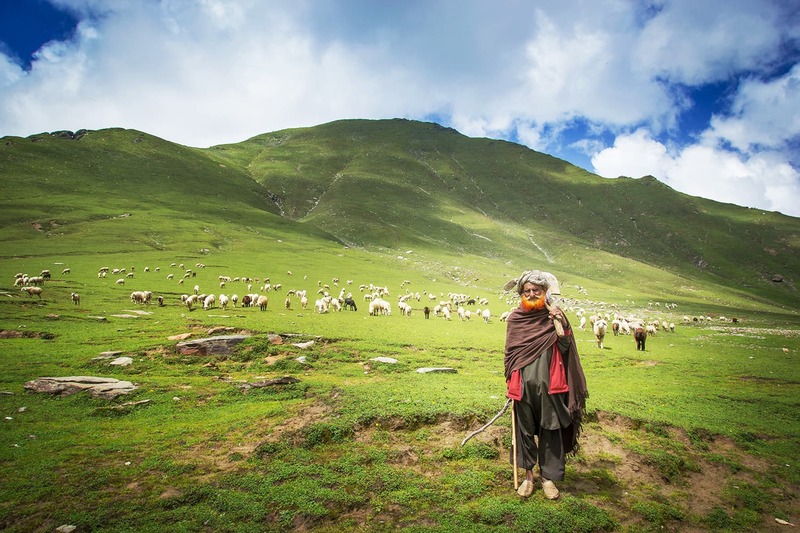 A friendly old man at Araam Gali with his flock of sheep. Jahanzeb, along with his nephew Yasir, met us at Araam Gali and we resumed our journey from there. The next four hours were spent in an extremely steep hike, which to amateurs like ourselves, felt nigh vertical. Adeel, Yasir and I were slowly making our way to the top whilst the other three guys vanished from our sight as soon as we hit the trail. Somehow, after a really tiring five kilometre-long trek, we reached Khanda Gali. It was now two in the afternoon. 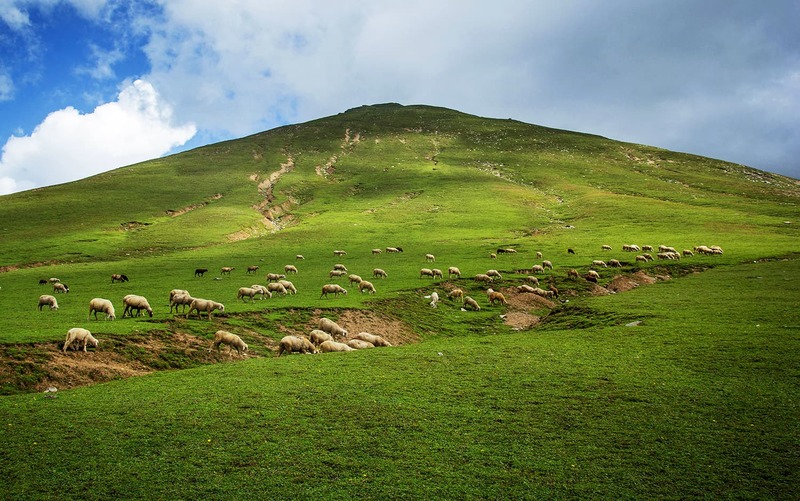 Situated at around 14,200 feet above sea level, Khanda Gali is a beautiful place and one of the tallest peaks of Siran Valley. The meadows are unbelievably gorgeous and resemble Pleja Meadows a little. In Khanda Gali, we met a few travellers and spent some time there resting and taking pictures. Another peak that is around a half-hour journey from Khanda Gali is Darwaza Gali, but we were so exhausted we couldn’t even contemplate going there. Resting after a tiring hike at the Chorr meadows. A night shot of the masjid where we spent our third night in Chorr. The next step in our journey was Chorr, some five kilometres from Khanda Gali. As we were not sure whether we would make it to Neeli Nadi that day, we all agreed to visit Chorr first. Aurangzeb’s (our new guide) father-in-law lives in Chorr and he was awaiting us at his residence. So once again, we hit the road on foot. 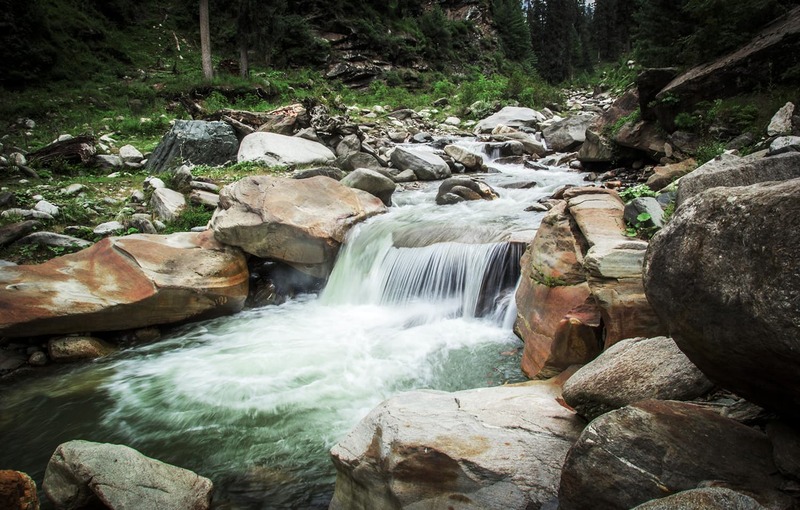 The journey from Khanda Gali to Chorr was not a bad trek, but we had to first reach a water stream and climb uphill to get to the place where we were to spend the night. When we reached the stream, we had a meeting about how much time we had left of our trip. There was lots to think about. We had badly wanted to include Neeli Nadi to our list of places we would visit. But Babar had to return to work as soon as possible and he did not want to spend another day travelling, so we made the decision to go to Neeli Nadi first. On our way to Neeli Nadi, we had to climb another mountain and then go down a hill. Although we were hungry and tired, we knew we didn’t have much time to sit down and eat and had to press on to reach Neeli Nadi. It took us another three hours before we finally reached the spot, but the view that awaited us was so serene and beautiful that it made the journey absolutely worth it. We spent a lot of time just taking in the beautiful sights. 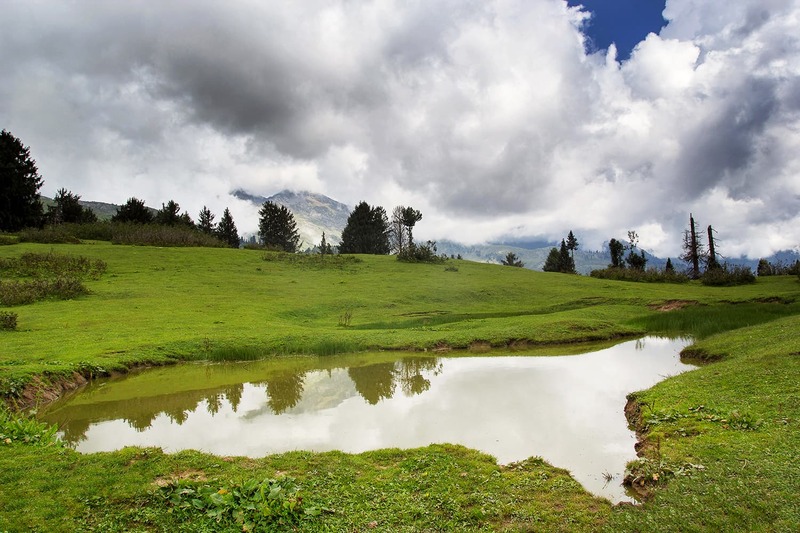 Around Neeli Nadi, there is a picturesque meadow. 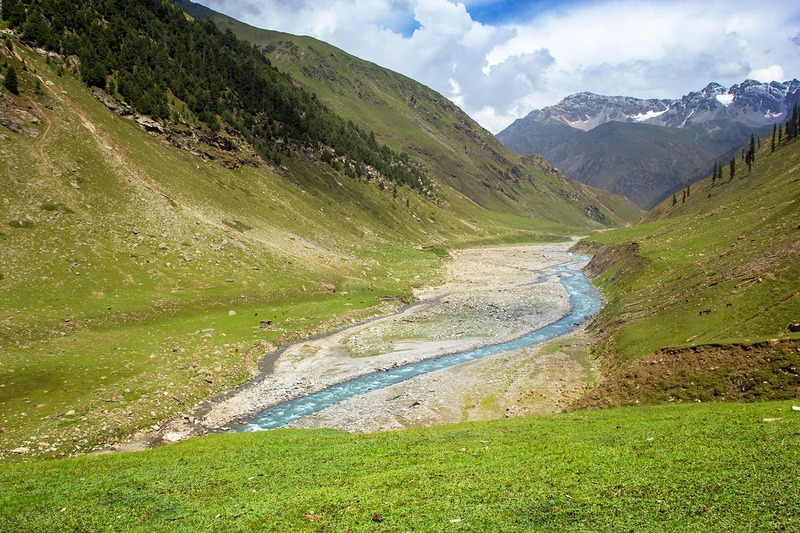 The water that makes its way over from Sira Da Kach in Kaghan Valley is blue. It drops into the Indus River near Dasu, Kohistan to make its way into Neeli Nadi. We were in Alai, Batagram District and had already crossed District Mansehra. The territory of Kohistan comes right after Neeli Nadi. We had spent nearly two hours at Neeli Nadi. 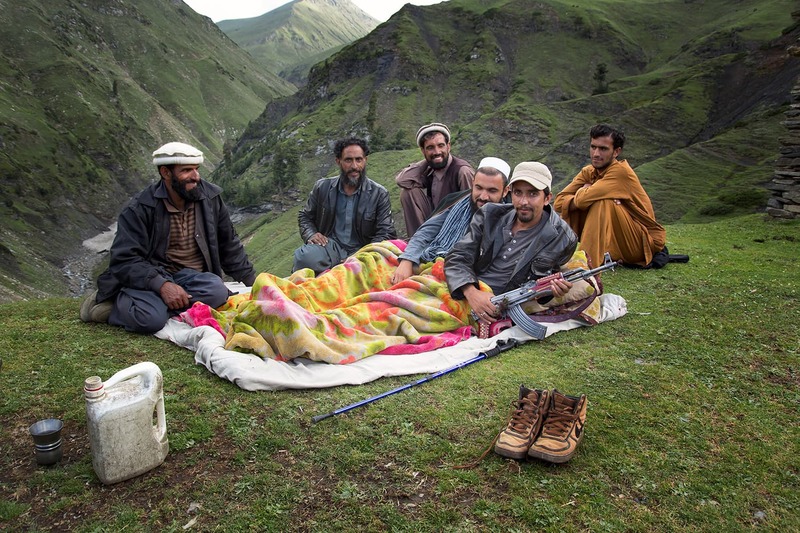 We spent time resting and chatting away as a goat herder played music on his flute for us. Then it was time for us to move again and head to Chorr. By 6pm we had reached the glacier there. A beautiful view of Neeli Nadi which originates from Sira Da Kach in Kaghan Valley and falls in River Indus in Kohistan Valley. My cousins, our guide and the goatherd at Neeli Nadi. It took us another 30 minutes before we reached the place we were going to stay for the night. We were extremely tired and ravenous. The final stretch to the top seemed to be the most difficult of our hike. Fortunately, when we reached it, our host was already there waiting for us. He had prepared some revitalising tea and served it with cookies. We sat in front of the mosque where we going to stay the night. It was colder, as we were at the top of the hill, so our host provided us with some blankets to keep us warm. After relaxing for some time, we proceeded to play cards. Later that evening, we entered the mosque and lit a fire to warm the place up. After a scrumptious dinner, I came outside and the sight of the skyline took my breath away. Normally, we don't get to see many stars because of all the bright city lights, but here the sight was stunning and crystal clear. I took out my camera to do some night photography and dedicated the next two hours to setting up my tripod and snapping away. As the temperature started to drop, we called it a night. The past three days had left us completely drained. 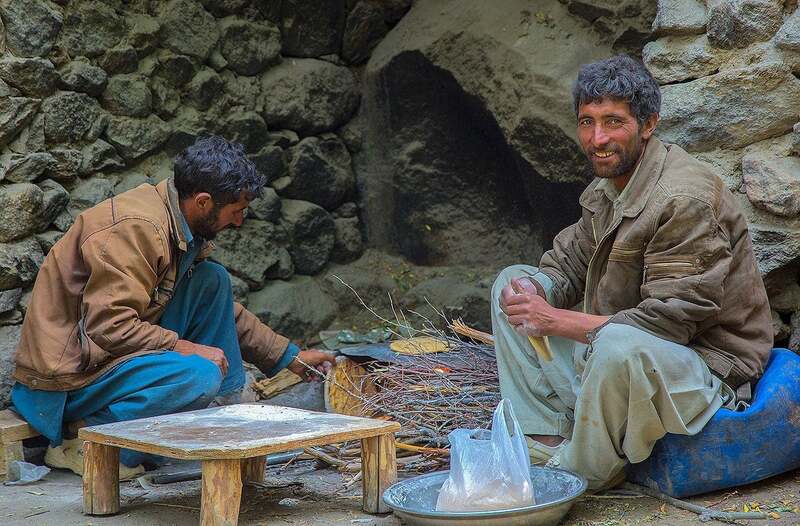 The next morning, Jahanzeb woke us up and we had a nice breakfast of organic bread and butter, after which we kicked off our journey back. We had planned to stay in Thanda or Kunaali but Babar was keen to reach Dhor. It was a tough task, as we had to walk the distance in one day, which we had previously covered in two. At first we had to walk downhill for some time. When we reached the glacier, we opted to catch our breath and spend some time there. A short while later, we resumed climbing. The top of Khanda Gali. 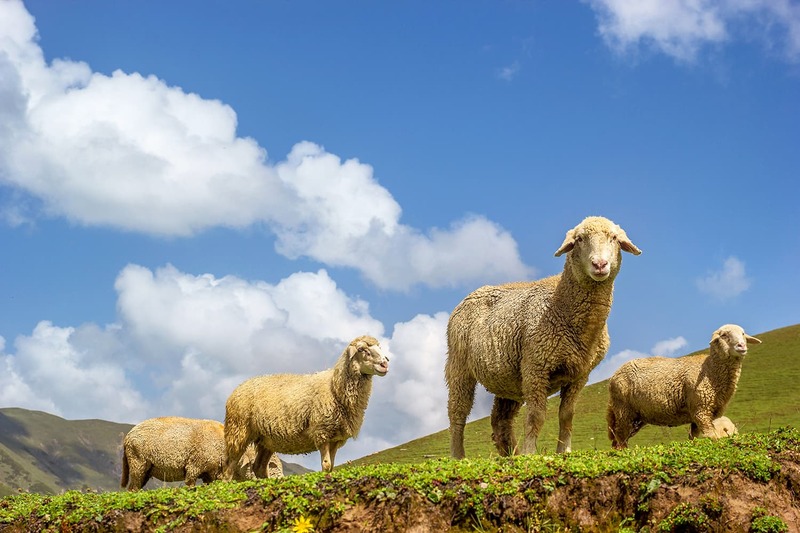 A flock of sheep in Khanda Gali. 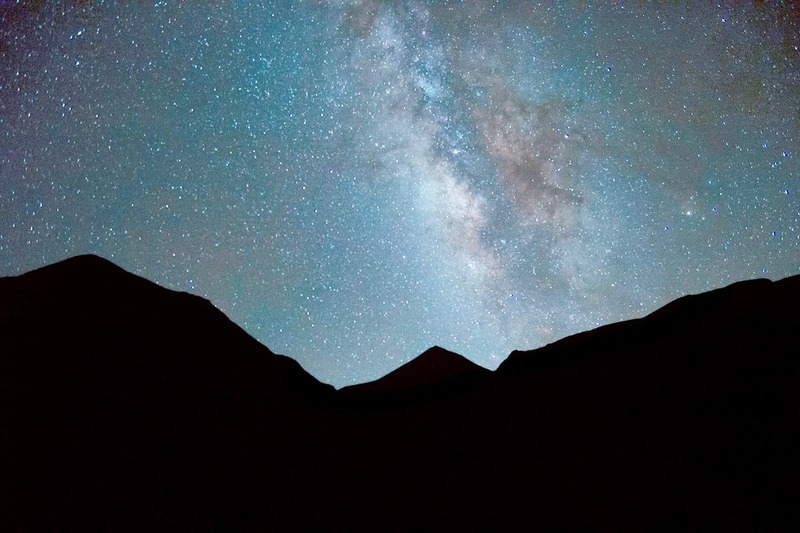 The magnificent Milky Way above the snow line of Khanda Gali. Our next stop was Khanda Gali and the trek was tough, especially for me because somehow I was having pain in my left knee. It was getting harder to continue walking. Four hours later, we reached Khanda Gali. Babar, Hammad, Jahanzeb and Yasir declared that they were going to keep going on to Darwaza Gali. However, Adeel and I chose to stop and take a break. Darwaza Gali is a half an hour hike from Khanda Gali. The gateway to Khanda Gali is a stone that resembles a door and that is where the place gets its name. When they got back, we picked up right where we had left off. We reached Thanda where we met Shafi again. He brought us lunch and we rested there for some time. 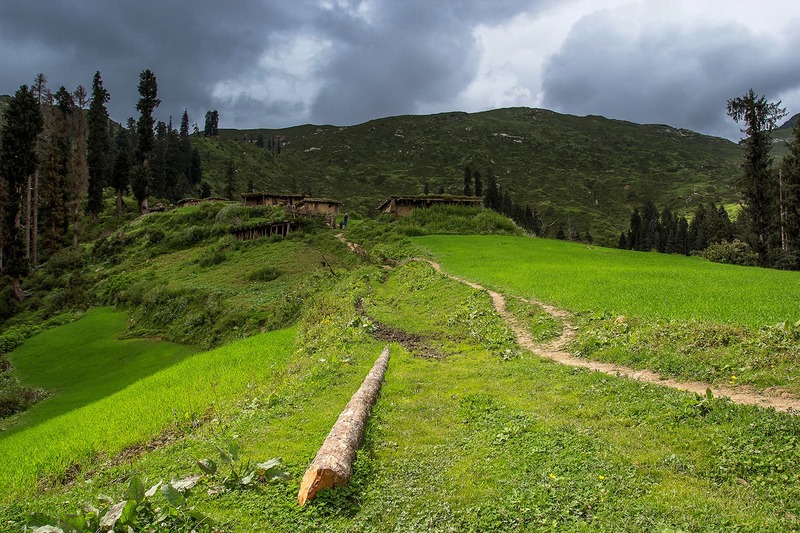 A view of the beautiful meadows of Kunaali. After lunch, we began walking again and reached Kunaali. Here, we had tea and then set on our journey downhill to Kaalu Ala Kalas. It was already getting dark in Kaalu Aala Kalaas but we continued, as we had to reach Dhor where Shah Hussain was waiting for us. Walking along the Siran River in the dark was not an easy task. And walking with a painful knee meant each step was even tougher. By the time we reached Dhor, we were walking in complete darkness. We came across a snake, but fortunately for us it slithered away. Shah Hussain greeted us when we arrived at Dhor. Once again, we were served a mouth-watering dinner, followed by tea. We were not too worried as it was the last day of our trip, and we were only 10 kilometres away from Mandagucha, and 30 kilometres from Jabori. Our guide Aurangzeb somewhere in Darwaza Gali. At the top of Darwaza Gali. That evening, I thought to gift my hiking stick to Waqas, Shah Hussain’s youngest son, as he seemed to like it and this was a way for me to show my gratitude for their hospitality. After having breakfast with Shah Hussain, we all bade him farewell and started our journey for Jacha and then on to Mandagucha. As we had been hiking for a few days now, 10 kilometres didn’t sound too daunting. We reached Jacha around 11am and by 1pm we were in Mandagucha. After another tea stop, every hiker’s go-to drink, we sat on the top of a Hiace van to continue our journey. By 2pm we were in Jabori. Here, I hired a minivan and reached my home city, Mansehra, by 5pm. A shy little girl in Dhor who offered us tea. The beautiful River Siran in Mandagucha. It had been an amazing journey full of exploration, discovery, laughter, fun and mind-blowing sights. Our one regret was that we couldn’t spend longer exploring all the places we had visited. As Babar and Adeel had to get back to work, we had to keep this trip short. But nevertheless, it had been a truly memorable one. We had totally immersed ourselves into the experience, hiking from the very first day, enjoying lots of organic food, and making plenty of new friends. Best of all, we got to see some of the most glorious landscapes any traveller’s eyes can have the fortune of beholding. The author loves to travel and write, tweet, and teach everything related to travel photography. He can be reached at www.facebook.com/faysal9. Stunning views, thanks you mad my day. beautiful places worth seeing. Faysal9 great work, i am seeing it in Burundi. 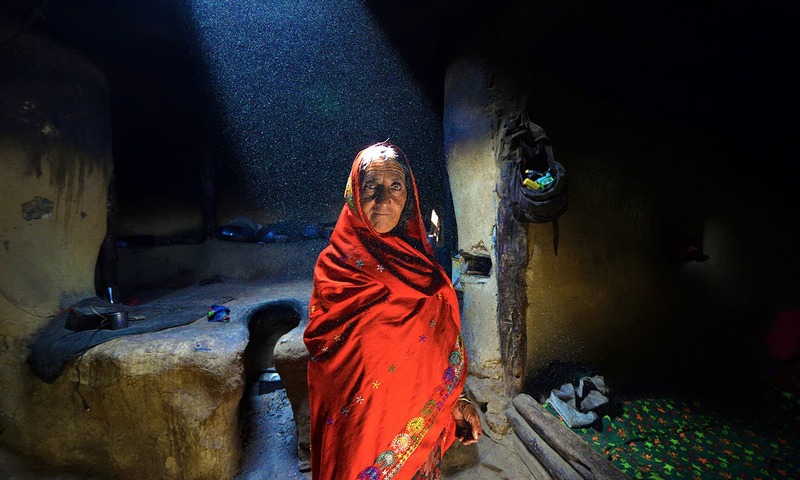 Beautifully narrated story of a stunning sojourn. Loved the details and images that took me to all the places you mentioned and trekking you did. Thanx for this masterpiece. An other magical journey through magical land; Thank you. WoW, great trip, pics, write up, all excellent, I would say unseen Pakistan, we usually go to popular and crowded places in Pakistan, which are too much expensive and nature on the ruin due to over crowding, rarely we see or go such unseen places, which I admire of too but find no means to go !! WOW! This was beautiful. I hope i can go there someday, just hope that I will be safe around there and my parents agree to go. Your writing skills are fantastic though. I want to place this on my desktop as wall papers. but alas , no scope. Breath taking photos with an excellent write up.Keep it up dear. Wonderful site, wonderfully explord. Thanks, its a great treat for readers. Breathtaking and stunning...just curious why the locals are not planting trees here in billion tree campaign, denuded mountains and valleys is a sad affair. 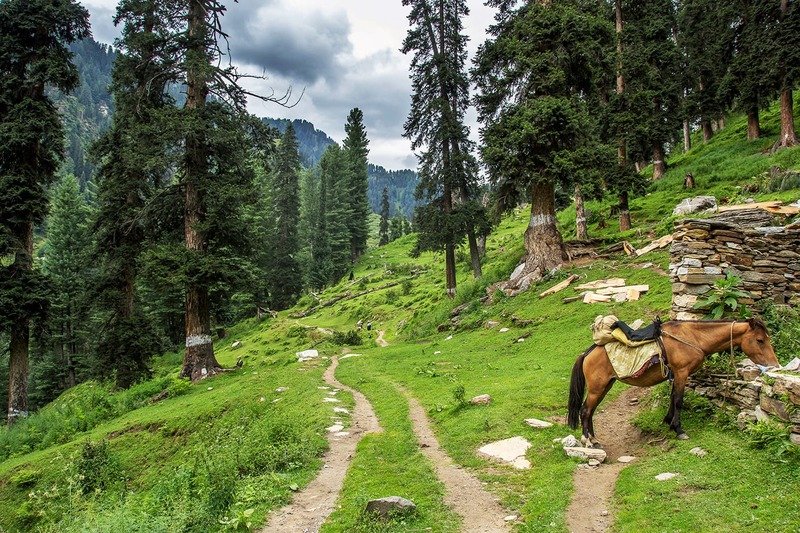 Trees are the jewels of the earth, and many times more trees are needed up north and elsewhere in Pakistan. Yes the pictures are breathtaking...specially the one with thick forest cover. Great and extremely commendable efforts by the writer. Hope our authorities can make this a tourist spot so people can from all over the world can come and enjoy the beauty and tranquility. Beautiful pictures. Looks like Switzerland. Wow! It was a joy to read this beautiful potrayal of a journey experience in such a simple yet awe-inspiring way. Photography is absolutely exquisite. Kudos Faysal! Beautiful pictures! 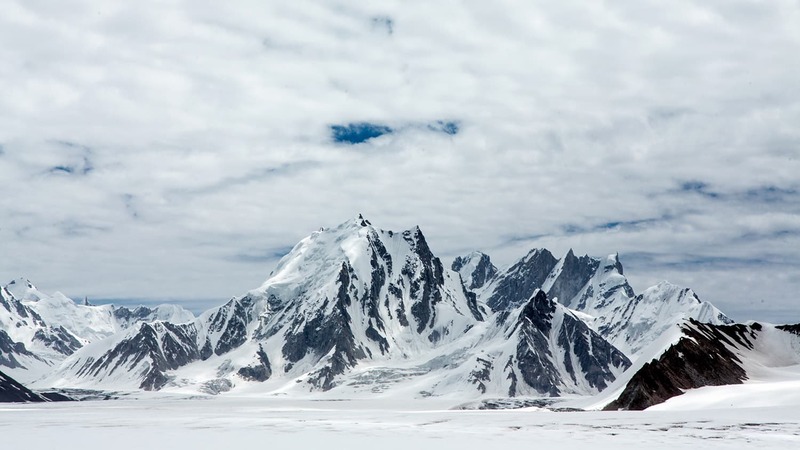 Two questions: You wrote "There is a place there called Panj Nadi, a sight of five big glaciers that originate from the Siran River." Can you further elaborate? 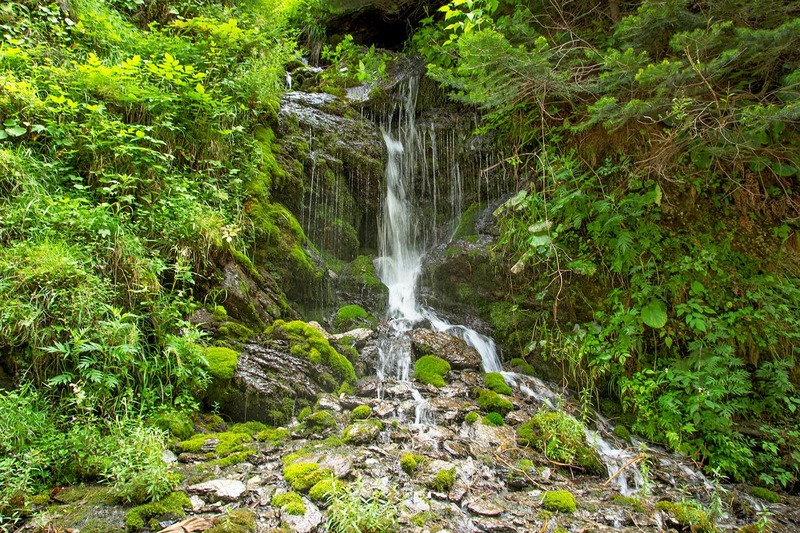 Which 5 glaciers originate from Siran River? 2: What camera did you use? How to get hold of the guide if i wanted to Hike? The writing is a bit simplistic but an enjoyable read nonetheless. In future, describe the area more including the sights, the colours, the smells. The emphasis seemed to be on the food which I can understand, as would anyone, who has hiked ! A note to fellow hikers - please go out and enjoy the outdoors. But please , please try and leave it as you find it. Do not litter with paper, cigarette butts or plastic. Bring all your trash back with you. 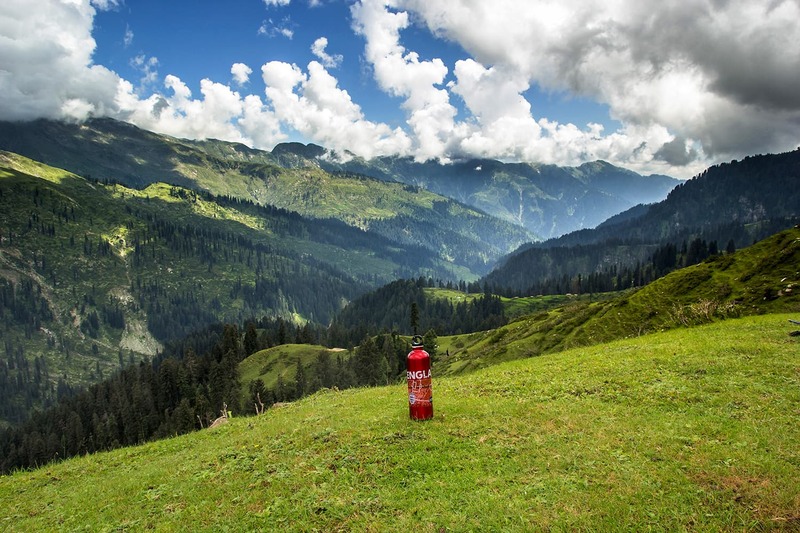 Its terrible to see plastic soda bottles, juice boxes, cigarette butts and toffee wrappers strewn around on an other pristine meadow or mountain top. Beautiful and well narrated the whole trip! Mansehra. Its a fantastic place. I am surely going to explore these places soon. A wonderful article. Thanks for showing different and lesser explored places of Pakistan. Excellent account. I loved this place when I first visited it. Your writeup has revealed places which I didnt know. Thanks for that, I'll definitely visit next summer. Pakistan is very beautiful for those who care leave their routine city life and explore their own country. Wonderful images and good write up, thanks for sharing the details of your trip. Hope to be able to carryout such trips some time in near future..
NIce work Faysal9. Love the country!!!!!!!!!!!!!!!!! Interesting trip with great pics. Looking forward for more trip stories from you . Well done. Beautiful photos! I hope areas such as these can be preserved for their natural beauty and draw in tourists who enjoy this clean environment. 150 out of 100! This is beautiful indeed. I wish I had a company to go to such places. I live in Oman. And I have to spend months long time and effort to make some one come along even for a 1 hour hike in the city mountains........ Most of the city people are just to lazy to go off-road. 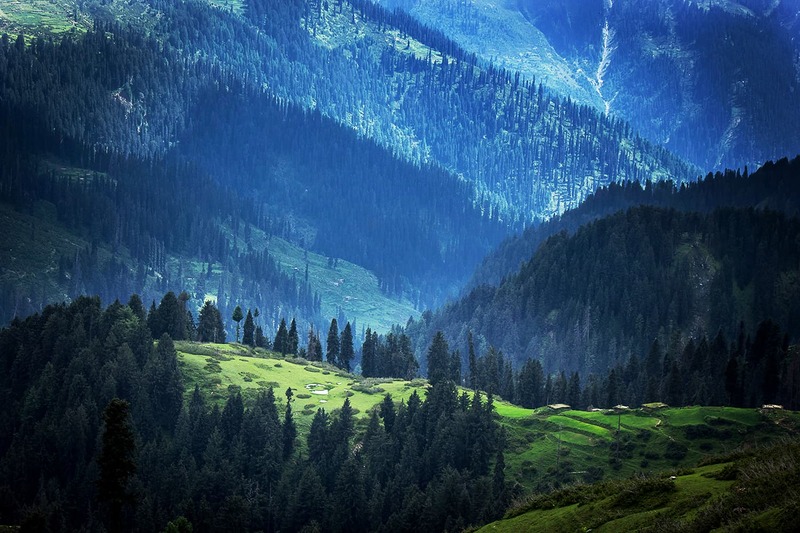 Exceedingly beautiful places in Pakistan. We must promote tourism and have international tourists as well as domestic tourists. Thank you so much for introducing us this beautiful part of our country, Pakistan. A wave of exhilaration passed in my body. My brothers, sisters, my land and my, my earth. Thanks our Quiad, Mr Liquiat, sir Iqbal and who ever gave their efforts and lives so we could have Pakistan. I have tears as I am 68 years old away from Pakistan and miss it so much. Again thanks. Unbelievable scenery, never heard of these places before. Wonderful discovery my friend. Well done! This legit made my day. Hats off to the author.